At a recent facilitation training workshop organized by AWARD in Nyeri, Kenya, 20 AWARD Mentors, staff and trainee trainers enhanced their facilitation skills. As part of its capacity-building mandate, AWARD is currently running a training of trainers (TOT) program. The current AWARD trainers share their skills with trainee trainers drawn from across the continent. The workshop was led by facilitation experts, Community at Work. Much as most participants had facilitation experience, they still took home valuable lessons. This was a practical course that had all participants engaged. They learned how to deal with group dynamics and incorporate all participants in the session. The skills gained at the workshop, such as active listening, are useful in day-to-day communication, such as meetings and workshops. Margaret Kroma, Dorothy Mukhebi and Pauline Bomett are already sharing the skills gained at the workshop with other staff members. During a recent AWARD retreat, staff shared skills such as chart writing and giving feedback. AWARD is explicitly designed to empower African women in agricultural research and development to serve as champions of rural women and to increase their visibility. Through its specially tailored leadership training courses, AWARD Fellows learn to navigate organizational gender issues, leverage team talents, manage conflict and use influence appropriately. Fellows also put their leadership skills to practice while serving as role models to inspire girls and younger women to take up a career in agricultural science. “I am still reeling from the impact of the Women’s Leadership Course. The training was so practical and helpful. I wish there could be a system of passing this knowledge to the young women, aged 25-30 years, as early as possible. They will grow challenged to create impact in their lives without loss of time. In recognition of World AIDS Day, we feature a Ugandan fellow who has worked in the field of HIV/AIDS, Esther Wamono, nutrition surveillance officer with Action Against Hunger/Action Contre la Faim (ACF). 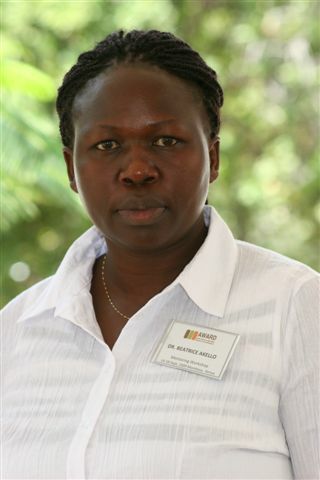 Esther is mentored by Dr. Joyce Kikafunda, associate professor, food and nutrition sciences, Makerere University, Uganda. She holds a master’s degree in applied human nutrition from Makerere university. A recent graduate, Esther, 31, is already tackling the high levels of malnutrition in her resource-rich country, especially among children under five years of age and people living with HIV/AIDS. Her master’s thesis focused on nutrient enhancement in bananas to improve the nutritional intake of people living with HIV/AIDS. As part of her research, Esther developed nutrient-enhanced banana flour which she supplied to rural women living with HIV/AIDS. The flour was well-accepted by the women who agreed that the staple food has great potential to increase their nutrition and food security. Esther says her participation in AWARD’s professional development courses has resulted in greater self-confidence. During the AWARD mentoring orientation workshop in October 2009, she developed her life purpose goal: to eliminate malnutrition among women of reproductive age and children under five years of age in Uganda. “I decided that the first step on my professional road map was to get a job with an international NGO,” says Esther, who previously worked as a research assistant at Makerere University. She successfully applied to Action Against Hunger/Action Contre la Faim (ACF) and began her new job as a nutrition surveillance officer in November. Esther combines her professional research on nutrition and HIV/AIDS with hands-on care for women and children affected by the disease and by malnutrition. In Kampala, she offers nutrition counselling and education to poor urban families through an outreach program at her church and she has served as a volunteer at an orphanage. Poetry writing has now become an AWARD tradition. At last year’s mentoring orientation workshops (MOWs), three poems were composed, inspired by Thema’s Journey and the mentoring orientation workshops. AWARD Fellows, Emanuella Eguagie (Nigeria) and Mboka Mwanitu (Tanzania), together with mentor Dr. Kenneth Wiyo (Malawi) and Stephen Mensah, trainee trainer, (Ghana) also caught the poetry bug. This year, two AWARD Fellows wrote and recited the following poems at the MOWs. Started when I received an award. Waiting for the fate of my application. Is indeed a great reward. in Agricultural Research and Development. But couldn’t go against their culture. To make true, another woman’s dream. Gathered because of AWARD fellowship. I cannot help but, my Creator worship. Has given me a great reward. With other women in AWARD. Please hear my word as we take the walk. Women dancing, and everyone was glad. A baby girl is born, and in joy she was clad. Darling of my brothers, my grannies and my dad. We were taught by the society that we were different from our brothers. Ardo, Wamono, Nadhoka, Mutonyi, Cherunya should cook and serve my brothers. Remember, this is the destiny of our sisters and our mothers. Destiny! Lugwana, Tuei, Matsimbe, Hamiyanze, Chisenga didn’t believe this to the letter. And college was over, interviews came calling in one by one. “We need a pilot” and my brother was gone. A centre director, “a man’s job” my next brother followed. Remember “chiefs” are much better being men; our last born brother followed. Florence and others, have dared the omen. Daring too, have followed in the footsteps of these women. Weaving in the world of science, has not been without a whine. Rendering to the community, the dreams of the fellows. Delivering to the fellows, the joy of the mentors. At the peak of a desire, a dream was born. And as all these dreams come to be true, we will change Africa. YES WE CAN. GOD BLESS AWARD. 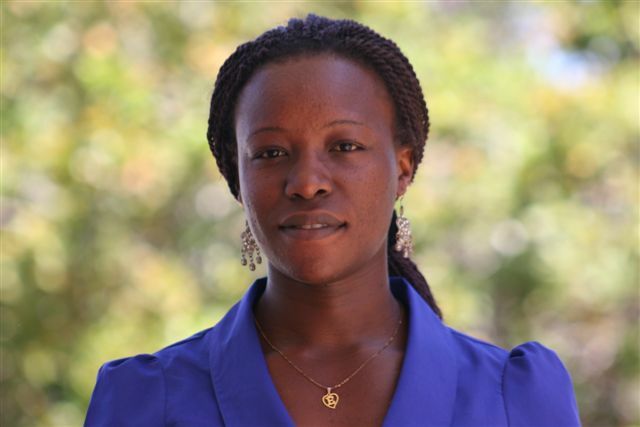 AWARD fellow, Mary Njenga shares her experiences at the Beahrs Environmental Leadership Program (ELP) held from 26 June to 18 July 2009 at the College of Natural Resources, Center for Sustainable Resource Development, University of California, Berkeley, USA. 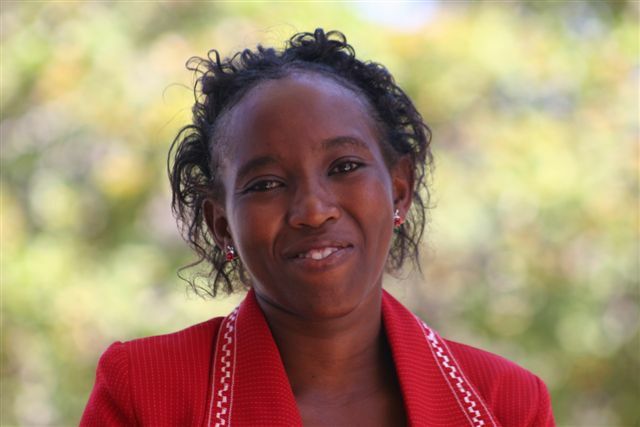 Mary Njenga is a research officer with Urban Harvest-CIP and a PhD student at the Department of Land Resource Management and Agricultural Technology, University of Nairobi under the lead supervision of Prof. Nancy Karanja. Mary’s PhD research is also affiliated to World Agroforestry Centre (ICRAF) under the supervision of Dr. Ramni Jamnadass. The Environmental Leadership Program (ELP) offers a summer certificate course in Sustainable Environmental Management, co-directed by Dr. Robin Marsh and Dr. David Zilberman. Others in the team were Don Lauro, Elna Brunckhorst, Jade Sasser, Joy Harewood and Aaron Wilson. This year’s course had 34 students from 25 countries. ELP 2009 curriculum covered ecological footprint and sustainability, population, poverty and the environment, and a special open-to-the-public conference on bioeconomy: energy, food and the environment. Based on her work, Mary was among three ELP students invited to make presentations and be a panelist during the Perspectives on Biodiversity: Agriculture and food security session. Mary’s presentation was on urban agriculture and urban ecosystem services. She highlighted the role of urban agriculture ensuring food security, income and urban resource re-use. In her presentation, she demonstrated how urban agriculture benefits women and youth groups. Other topics in the course include environmental policy services and marketing, leadership for collaborative change, climate change science and policy and water and sanitation management and governance. The course was very interactive through lecturers, guided crop and livestock field visits, practical work and demonstrations, as well as social events. (iii) a network of environmental leaders and friends around the world speaking the same language for a sustainable future. The course coordinating team and lecturers were very warm and the participation of some of them throughout all sessions created a chance for feedback and revisions as the course progressed. Participants had a chance to interact with Robert J. Birgeneau, Chancellor of the University of California, Berkeley. Mary received a full scholarship from ELP, while her travel and living expenses were met by Doyle Foundation, Scotland to whom she is very grateful. ELP participants were invited to apply for a small competitive grant for initiatives to be implemented in collaboration with UC Berkeley in 2010. Mary had a very special homecoming upon learning that she was one of the winners of African Women in Agricultural Research and Development (AWARD) fellowship 2009, offered by Gender and Diversity, a CGIAR program that supports scientific capacity, provides mentorship, leadership and management training. At the same time she won the International Development Research Centre (IDRC) ECOPOLIS graduate fellowship 2009 which will go a long way in supporting her PhD study. To all who contributed to a very productive and exciting one month, Mary says THANK YOU. 5 August 2009 was a historic day for the CGIAR Gender & Diversity Program. Our AWARD project for African Women in Agricultural Research and Development met with US Secretary of State Hillary Clinton! NAIROBI, KENYA (5 August 2009) — Expressing concern over the lack of women in decision making roles in agricultural development issues in Africa, a group of leading African women scientists urged African leaders and US policymakers to put women at the center of efforts to address chronic hunger and poverty in sub-Saharan Africa. During a visit by US Secretary of State Hillary Clinton and Secretary of Agriculture Tom Vilsack to research facilities outside Nairobi, the group, comprising both veteran and up-and-coming Kenyan women scientists, argued that, only if women can exert more influence over priorities, policies and programs, will sub-Saharan Africa be able to ward off future food crises and cope effectively with more frequent drought and other impacts of climate change. Women account for as much as 80 percent of Africa’s food production. But their access to land, to vital services, such as credit, and to improved technologies is extremely limited. They receive only 5 percent of agricultural extension training and 10 percent of rural credit. Furthermore, few agricultural projects are being designed to address women’s specific needs. Only a quarter of its researchers and development experts are women, and only 14 percent of the management positions in agricultural research and development are female. Measures like the US Global Food Security Act of 2009 are a step in the right direction, the group said. But the impact of this initiative will be limited unless it is reinforced by more targeted efforts to provide Africa’s women farmers with the technical and financial resources they must have to respond to new economic opportunities. “Investing in women is the smart solution to Africa’s hunger,” said Kenyan horticulture professor Mary Abukutsa-Onyango. “It will help ensure that US development resources yield maximum returns in reducing food insecurity and poverty.” The women called on Clinton and Vilsack to help convey it to African policy makers. The scientists form part of a program called African Women in Agricultural Research and Development (AWARD). Coordinated by the Gender & Diversity Program of the Consultative Group on International Agricultural Research (CGIAR), AWARD provides 60 fellowships yearly to boost the female talent pool supporting Africa’s farmers, with support from the Bill & Melinda Gates Foundation and United States Agency for International Development (USAID). Despite the limitations faced by Africa’s female farmers, recent cases demonstrate how well-crafted policies and programs can achieve major impact by targeting women, based on knowledge of their important role in agricultural production, according to the World Development Report 2008: Agriculture for Development. A CGIAR program aimed at widening the impact of improved bean varieties reached more than 35 million rural people in seven countries of eastern and southern Africa by targeting women, who primarily grow the crop. Bean experts relied on informal channels to which female farmers have ready access, like community and church groups, for distributing small, affordable packets of bean seed. Offering 30 to 50 percent higher yields, the highly nutritious and marketable new beans are helping women bolster household food security and raise their incomes. Ommeh and Abukutsa-Onyango pointed to further opportunities for smart investment in women farmers, focused on the production of local chicken breeds that are resistant to disease and marketing of indigenous African vegetables. The scientists also stressed that, in order for such initiatives to multiply and succeed, it is vital that African women gain more influence over priorities, policies and programs. An encouraging sign are recent findings showing the gender gap in Africa’s agricultural science narrowing. Between 2000 and 2008, the proportion of female professional staff in Africa’s agricultural research and higher education grew from 18 to 24 percent, according to a recent study carried out by AWARD and the CGIAR-supported International Food Policy Research Institute (IFPRI). “Even women scientists who have completed their education and entered the work force may still drop out because of obstacles they encounter on the career ladder, so few reach positions of leadership,” said Wilde. “AWARD better enables these women to stay on track by supporting them in their efforts to help farmers in their countries.” Now in its second year, AWARD has provided fellowships to 120 women scientists from 10 countries in sub-Saharan Africa.